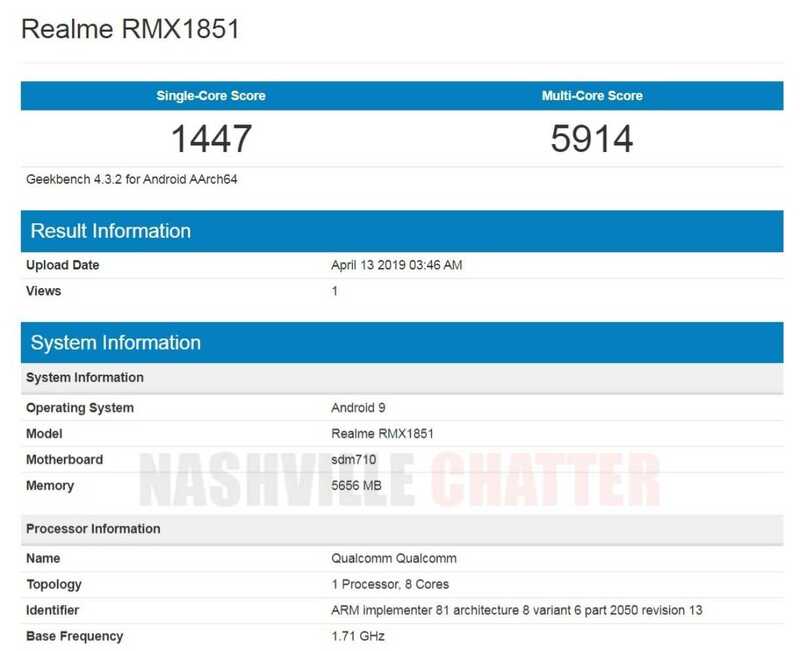 Realme 3 Pro phone with model number Realme RMX1851 has been benchmarked today in the Geekbench benchmarking site. Earlier, Realme 3 Pro was rumored to be powered by Qualcomm’s Snapdragon 710 processor and today’s Geekbench listing has confirmed that this smartphone is powered by the same processor that clocks at a speed of 1.71 GHz. The phone is coupled with a 6 GB RAM and will ship with Android 9 Pie OS out of the box. The single and multi-core scores on Geekbench are 1447 and 5914 respectively. These numbers are definitely better than its predecessor Realme 3 which was released last month with MediaTek’s Helip P60, processor which had similar single core cores in the range of 1400-1420 and multi-score score no greater than 5100 points. Realme 3 Pro is one of the first phones in its segment to support the playing of the game Fortnite. The phone is expected to have a notched display with a water-drop variant, quite similar to the one found in Redmi Note 7 Pro. Realme 3 Pro is expected to come with VOOC 3.0 fast charging technology. We can expect the phone to sport dual rear cameras but we don’t have any concrete evidence on the camera specs yet. May be there will be more teasers and tweets from the Realme CEO Seth as he has been pretty active on Twitter. He recently released a Realme 3 Pro teaser which suggests the phone is all about speed and the release date is confirmed for April 22 at an event to be held in Delhi University. Realme 3 Pro is expected to compete with the rival Xiaomi’s Redmi Note 7 Pro with pricing expected in the range of $200.